Ireland’s team to face the USA in The International King’s Cup has been confirmed at the conclusion of a final qualifying event at Lough Erne Resort. Following four regional qualifiers at Ennis Golf Club (Munster), Westport Golf Club (Connacht), Dunmurry Springs Golf Club (Leinster) and Lough Erne Resort (Ulster), 46 players arrived at the Co Fermanagh venue, focused on securing a place on Ireland’s 12 man (6 pairs) team to face the USA in May. The competitors battled testing crosswinds on the Faldo Championship course with the Warrenpoint duo of Ryan Gribben and David Barron carding the lowest round of the day, a superb three under par 69. “First and foremost we are absolutely delighted to be back at Lough Erne Resort for the King’s Cup,” said Ryan, a Barton Shield winner with the Co. Down club. The Warrenpoint boys have a great history in the event. In the inaugural King’s Cup, they prevailed in a sudden death play-off to win the title for Ireland. They will be hoping to feature strongly again this year (May 14-18) with the home side chasing a hat-trick of victories. “In the regional qualifier we enjoyed flat calm conditions, playing some steady golf to get through,” added Ryan. “The course played very differently for the final qualifier, with gusts of 20mph at times. We played some good golf on the front nine without holing any putts. “We found ourselves one over par playing the par five 14th, which I managed to eagle. David birdied 15, and I squeezed another birdie on 17 to shoot three under in testing conditions. We’d have taken that score before we started. Also returning for the 2018 tournament are the McKeever brothers from Kesh, Co. Fermanagh, both members of Donegal GC. The rest of the Ireland team is comprised of competitors from Tipperary, Clare, Wicklow, Dublin and Kildare. The Ryder Cup-style tournament, supported by Tourism NI, honours golf’s greatest ambassador, Mr Arnold Palmer. Both teams will stay on-site at Lough Erne Resort, with full access to The Golf Academy. The Irish team will receive specially commissioned outerwear courtesy of Glenmuir and both teams will attend a Gala dinner as part of the event. Oliver McNamara and Martin White (Ennis GC/Woodstock GC) 79. On the tee box at Warrenpoint Golf Club are, Irish international Colm Campbell; Andy Patterson, Assistant Director Tourism, Culture and Events: Kevin Stevens, Executive Officer, Golfing Union of Ireland (Ulster Branch); Marie Ward, Council Director of Enterprise, Regeneration and Tourism; John White, Chairman of Golfing Union Ireland (Ulster Branch); Austin Crawford, Captain of Kilkeel Golf Club; Raymond Duffin, Captain Warrenpoint Golf Club; and Newry, Mourne and Down District Council Chairperson Councillor Roisin Mulgrew. They’re going all in on junior golf in County Down this summer. Newry, Mourne and Down District Council in conjunction with the GUI (Ulster Branch), and ILGU (Northern District) have announced details of a new three-day junior event to run from 15-17 August. This new tournament, which will be hosted by Kilkeel, Warrenpoint and Royal County Down will be on at the same time as the Girls British Amateur Championship at Ardglass GC (14-18 August). The Newry, Mourne and Down Junior Summer Golf Trophy offers competition for all standards of golfer and at multiple age groups U18, U16 and U14. Competitors will play at Warrenpoint and Kilkeel with the leading 20 qualifiers earning the right to compete at Royal County Down. For the very young (U10) and beginners (those without an official handicap), a flag competition will run concurrently with the competitions in Kilkeel and Warrenpoint. Golfers will start on the 10th Tee and in 25 shots see how far they can get. After the flag competition, the club professionals will host a clinic for all participants. Prizes will be awarded in the flag competition based on age. She continued; “The Newry, Mourne and Down Junior Summer Trophy is an exciting new golf tournament that will be competitive, challenging and fun for junior golfers and aims to help every child enjoy the sport of golf. 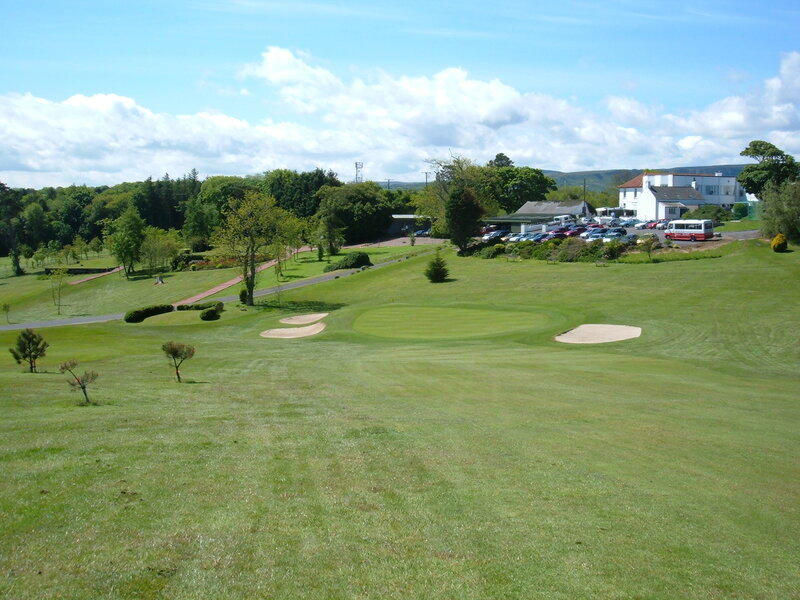 Chairman of the GUI (Ulster Branch) John White said; “The Golfing Union of Ireland (Ulster Branch) is delighted to be associated with Newry Mourne & Down District Council’s new golf competition “Junior Golf Summer Trophy”. For further information and to book your space, go to www.visitmournemountains.co.uk. The long-established Newry Mourne and Down Summer Trophy will also run alongside this exciting new junior event. Warrenpoint’s Colm Campbell produced a superb second round to win the 36 hole One Finance Dundalk Scratch Cup at Dundalk Golf Club. The 30-year-old Irish international shot a five under par 67 to pip Massereene’s Tiarnan McLarnon on countback after the two Ulster players were tied on 138, six under par. “It was a good battle coming down the last few holes with Tiarnan and I just pipped him,” said Colm. Defending champion, Dundalk’s Caolan Rafferty, finished two shots further back in third. The three internationals played together in the marquee group and were in contention after the opening round. Rafferty and McLarnon carded two under par 70s while Campbell was a shot further back. Slieve Russell’s Seamus Cullen led after the opening round, signing for an excellent four under par 68 which included five birdies. Another Dundalk representative, Eoin Murphy, was in second place, one shot back after signing for a three under par round of 69. Cullen was unable to keep the momentum going and dropped out of contention after a second round 76 while a lost ball off the 15th tee saw the end of Murphy’s challenge as he faded to a 77. It was another Dundalk player, a former winner and course record holder Aaron Grant, who set the early clubhouse lead as he added a three under par 69 to his opening 73 for a two under par total of 142. Cairndhu’s Ryan McKinstry, who started the second round at level par, got to six under with three to play but he then double-bogeyed 16 and bogeyed 17 to finish on three-under. He held the clubhouse lead momentarily as the top three were in the group behind and were producing fireworks of their own with McLarnon eagling the par-five sixth to go to four under. Back-to-back birdies on the ninth and 10th plus a birdie three on the 14th got him to seven under while Campbell was on six under at that point after five birdies of his own. Not to be outdone, Rafferty had thrown in four successive birdies from the sixth but back to back double bogeys at the 11th and 12th ended his charge. A bogey at 16 saw McLarnon drop back to six under while a birdie two at 17 got Campbell to six under and in the end it proved decisive as Campbell’s second round 67 was enough for him to pip McLarnon’s 68 on countback as they both tied on 138. Cork’s Peter O’Keeffe (Douglas GC) showed the value of experience as he eased to a three-shot victory at the Flogas Irish Amateur Championship on Sunday. A patient approach around Royal County Down paid off for the former professional as he closed with a two over par 73 to finish three shots ahead of Scotland’s Christopher MacLean and England’s Tom Sloman. “I am absolutely delighted. I had a feeling I was going to win something big this season,” said the 35-year-old. O’Keeffe made six visits to the European Tour Q-school before reapplying for his amateur status at the end of 2013. He was then forced to sit out a two-year eligibility period and returned to the amateur game in 2016. “It was tough. I always knew that I was going to be competitive at some level again. It wasn’t a case of retiring,” he added. And while his professional career may not have gone as planned, the experience gained was put to good use as he plotted his way around the Championship course. “I don’t get flustered on a golf course anymore. When I was on tour, I had a buddy in Dave Connolly caddying for me, and he will tell you that was our big thing,” he said. “There were times when I’d be ripping gloves off my hand on the golf course. Crazy stuff. I have done a complete full circle on that. But that took a lot of work. It took a long time and a lot of bad experiences to realise that was the way forward. Peter began Sunday’s final 18 holes one shot ahead of MacLean and two shots ahead of Belvoir Park’s Marc Norton and England’s Matthew Jordan. He played the front nine in level par 35 and turning for home, had extended his advantage to four shots. A birdie at the 11th extended his lead to five before his only wobble of the day at 15th when he managed to four-putt. “Yes I felt pressure, I lost concentration on the 15th green but I ground out a par on the next hole and then I just cruised in really,” he added. Norton’s challenge was effectively ended on the ninth when he walked off with a quadruple bogey eight. The 19-year-old eventually signed for a 12 over 72 that saw him finish in a share of 39th. Defending champion, Colm Campbell (Warrenpoint), who opened with a disastrous eight over par 79, battled back to end the tournament tied for 30th alongside Colin Fairweather (Knock) on 12 over par. It’s easy to forget that playing any sport well in front of big crowds doesn’t come naturally. Like so many things, it’s a skill that has to be learned and usually that experience comes the hard way. Just ask Chris Selfridge – the Challenge Tour player from Castledawson was speaking on the NI Golf Podcast about the experience of contending at the NI Open last year. In contention after two rounds, Chris found himself playing in front of a packed gallery on the Saturday at Galgorm Castle and described it a bit of ‘wow’ moment. “It was brilliant…. but I was almost overwhelmed by the crowds…but it’s all part of the learning,” said Chris who has already clocked up a fourth place finish on the Challenge Tour this season. In Chris’ defence, the NI Open stands out on the Challenge Tour in terms of attendance levels. The tournament has attracted upwards of 35,000 in recent years with organisers ambitious about breaking the 40,000 mark this year when the event returns for a fourth successive year in July 28-July 31. To put that into some context, when Chris was playing in the final group in Madrid a couple of weeks ago he reckons there was approximately 30 people in the crowd. 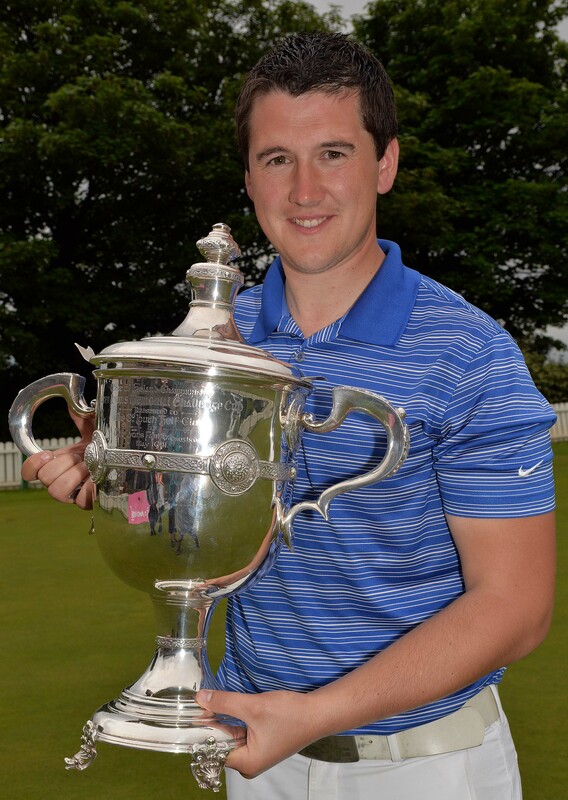 Episode three also features an interview with Warrenpoint’s Colm Campbell who will be playing this week in the Irish Open at the K Club courtesy of his superb victory in the Flogas Irish Amateur Open at Royal Dublin. The Irish international explains how he managed to keep Irish team mate and world number 10, Jack Hume at bay over the closing holes to record the biggest win of his career to date. There’s also another chance to win a ranging session on Trackman with Andrew Morris golf. At the ripe old age of 27, Warrenpoint’s Colm Campbell has taken the plunge and committed himself to a full-time amateur schedule. The reigning East of Ireland champion, a member of Ireland’s 2014 Home International winning side has taken a career break from his job with telecoms firm 02 to focus on his golf. “I don’t want to have any regrets about anything and now that I am involved with the Irish squad there are more opportunities and you have to be available,” said Campbell who is due to get married in December next year. Colm’s move comes at a time when there has been widespread debate about the scheduling and format of Ireland’s leading events and the impact it is having on those golfers who are trying to hold down a full-time job and compete. The pressure of trying to juggle work and playing commitments is one Colm is well acquainted with himself. During last year’s Irish Amateur Championship he finished playing in one of early rounds and had to hop in the car and drive back up the road to work. “The main thing is that now I will have more time to prepare myself and practice properly,” he added. “Last year I was going from tournament to work and then back on the road to another tournament. It worked out well in the end but I couldn’t keep doing it. “Going full-time wasn’t an easy decision to make but at least I know that I have a job there if I decide to return. Colm’s first port of call will be the West of the Ireland Championship at Co Sligo GC which gets underway with a qualifier on April 1. 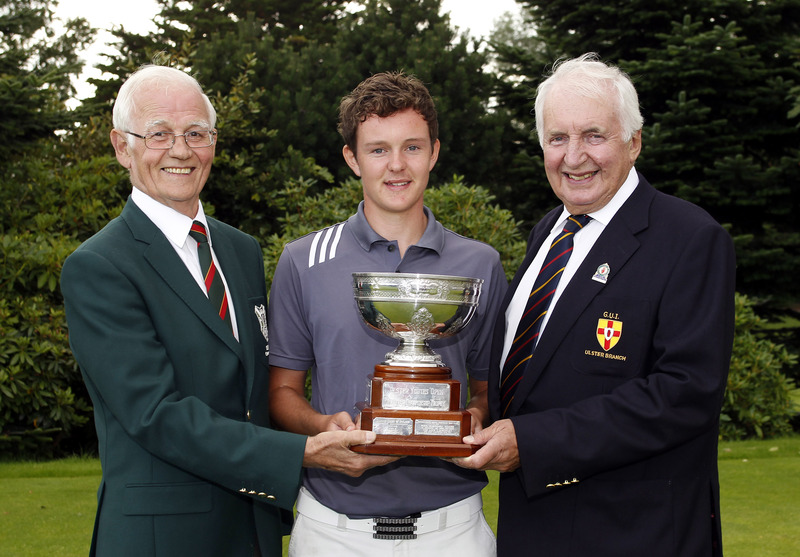 John-Ross Galbraith (Whitehead) wins the 2014 Ulster Youths Championship at Balmoral Golf Club. Pictured with Balmoral Captain and GUI Ulster Branch Chairman Peter Sinclair. Image Credit David Ross/Ulster Golf. The Golfing Union of Ireland (GUI) has nominated four of their elite amateurs to compete in the £140,000 (€170,000) Northern Ireland Open, in association with Maui Jim Sunglasses, to take place at Galgorm Castle Golf Club from August 28-31. 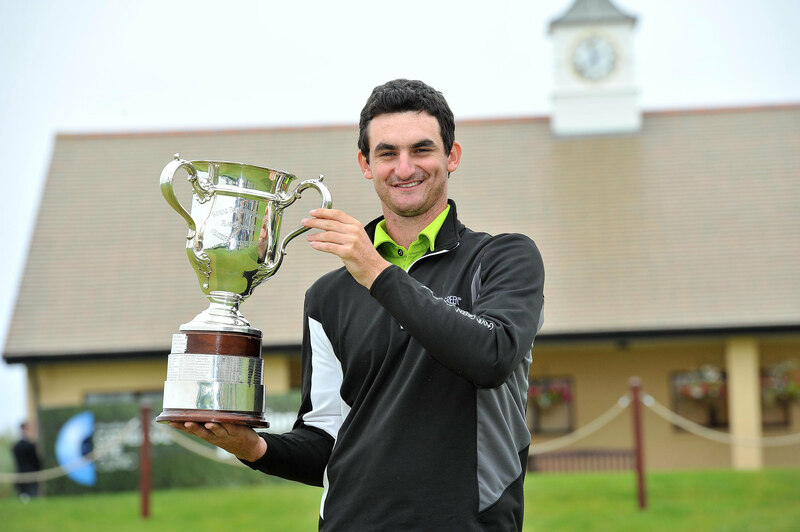 The 2014 Irish Amateur Close champion John-Ross Galbraith (Whitehead Golf Club) will join this year’s East of Ireland winner Colm Campbell (Warrenpoint) and Irish internationals Cormac Sharvin from Ardglass and local favourite Dermot McElroy from Ballymena. Taking their place in the 156-player field for the European Challenge Tour event is an excellent opportunity for four of the country’s top amateurs to test themselves against the leading professionals in Europe. “It is widely acknowledged within golf that crossing the pathway from elite amateur to professional golf is very difficult,” explained Kevin Stevens, General Secretary, GUI Ulster Branch. “Only a select few exceptional golfers successfully make the transition. The GUI (Ulster Branch) recognises that the NI Open provides a unique and, indeed the only opportunity currently in Northern Ireland, for elite amateurs to experience playing in tour conditions. McElroy for one knows what to expect after he put in a sterling performance to finish tied ninth on six-under in last year’s inaugural event. “I am hoping that I can improve on last year’s finish and look forward to enjoying the tournament as much as I did last year,” explained McElroy, who was second in the South African Amateur earlier this year and reached the final stage of Qualifying School at the end of 2013. Sharvin (21), who studies at Stirling University, is the current British University champion and is also ready for the challenge. “I am delighted to be part of the prestigious event and look forward to competing against some of the biggest names in the game,” said the 2013 Irish Close champion. The four amateurs will also play on the Ireland at the Home Internationals at Southerndown Golf Club in Wales from August 13-15. Campbell and Galbraith will make their senior Ireland debuts in Wales. Chris Selfridge (Moyola Park) remains on course for back-to back North of Ireland Amateur Championship wins after booking his place in today’s last four at Royal Portrush. The 21-year-old saw off Matthew McClean (Balmoral) and Darragh Coghlan (Portmarnock) yesterday to set up an all-Ulster semi-final clash against David Mulholland (Castlerock GC) at the Cathedral Eye Clinic sponsored event. In yesterday’s quarter-final meeting against Coghlan he raced into a six hole lead after nine but was pegged back by his opponent, eventually winning 3&2. “I was cruising but then I made it a bit harder for myself,” said the University of Toledo student who has been working closely with performance coach Fergie Wallace this week. Selfridge is something of a course specialist at Royal Portrush. He won the Irish Close at the famous links in 2012 and followed that up with last year’s win at the North but he will need to call on all that big match experience this morning against Mulholland. The 48-year-old eye surgeon at Altnagelvin Hospital shocked everyone including himself by seeing off the highly fancied Reeve Whitson (Mourne) in the last eight. A regular competitor at the event, Mulholland has never got any further than the quarter-finals of this tournament. His best Championship finish was back in 1988 when he lost out in the final of the Irish Close to Garth McGimpsey. “I can’t believe it, I never thought I would get to the semi-finals,” he said. Whitson, who is pondering a move into the paid ranks, struggled with his rhythm against Mulholland and felt that the long gap between his morning (he beat Warrenpoint’s William Hanna 7&6) and afternoon matches contributed to a lack-lustre display. “I had a few opportunities to get back into the tie but couldn’t take them,” added Reeve. The other semi-final will feature former Irish Boys champion Robin Dawson (Faithlegg) and Richard Bridges (Stackstown). Dawson made a strong statement of intent by cruising past Alex Wilson (Portmarnock) 4&3 and Irish international Cormac Sharvin 5&3 in some style yesterday. The 18-year-old made a slow start against former Close champion Sharvin but a brilliant up and down from 100 yards out at the eighth kick-started his round and he never looked back as Sharvin wilted. His opponent this morning, Richard Bridges, picked up two notable Ulster scalps yesterday in Dermot McElroy (Ballymena) and Colm Campbell (Warrenpoint). The 27-year-old Leinster representative trailed early in both matches but showed great resilience to fight back winning both ties by a single hole. Round three: R Whitson (Mourne) bt W Hanna (Warrenpoint) 7&6; D Mulholland (Castlerock) bt J Hood (Galgorm Castle) 1 hole; D Coughlan (Portmarnock) bt S Bryan (Delgany) 3&1; C Selfridge (Moyola Pk) bt M McClean (Balmoral) 3&2; C Sharvin (Ardglass) bt T Harris (Castletown) 1 hole; R Dawson (Faithlegg) bt A Wilson (Portmarnock) 4&3; R Bridges (Stackstown) bt D McElroy (Ballymena) 1 hole; C Campbell (Warrenpoint) bt T Gandy (Castletown). Round Four:Mulholland bt Whitson 2&1; Selfridge bt Coughlan 3&2; Dawson bt Sharvin 5&3; Bridges bt Campbell at 19th. 8.40am – Dawson v Bridges. Warrenpoint’s Colm Campbell made a long overdue breakthrough onto the national stage by winning the East of Ireland Championship at Co Louth GC. The 27-year-old held off defending champion Paul Dunne (Greystones) with Gary Hurley (West Waterford) finishing in third place. Campbell carded a third round 68, including an ace at the 15th, to take a four-shot lead into the final round and then closed with a two over 74 to win by two from Dunne on six under. “To get one of these championships isn’t easy come by, there are a lot of great players out there,” said Campbell who had his uncle, former amateur legend Paddy Gribben acting as caddy. “I played really good all week. Tee to green, I was really solid. “Last year was a real struggle for me but I worked hard over the winter on my game with Paddy and also spent a lot of time working on my fitness. “I went to the West of Ireland Championship and made it to the last 16, before losing to Jack Hume who went on to win it. “I beat Harry Diamond along the way and that gave me a lot of confidence. Harry is one of the most competitive guys out there and to beat him left me thinking that I was on the right track. Campbell is now targeting a return to Ulster colours for the inter-provincial championships. He will be back in action this week at the Irish Close Championship. CAIRNDHU’S smooth progress to the semi-finals of the Fred Daly Trophy today at Massereene has had a significant impact on the club’s hopes of Barton Shield glory. The Co Antrim club has managed to mix and match his season but unfortunately the Barton Shield semi-finals have also been scheduled for today. “It’s a shame that the dates clashed. Three of the lads, Ryan Long, Stephen Watt and Marc McKinstry played in the last round of the Barton Shield,” said team manager Ronnie Ferguson. Beaten in the 2011 Ulster final, Cairndhu went one step further last year and Ferguson believes they may be even stronger this term. “We will actually only lose one off the current squad next year as well,” he said. Cairndhu will line up against Belvoir Park this morning with Lurgan facing Foyle in the other semi-final. As a result the Barton Shield team will be greatly changed for their meeting against Clandeboye today in the foursomes battle at Shandon Park. The other semi-final is a mouth watering tie between Barton Shield experts Warrenpoint and Rosapenna. The Co Donegal club has been making strong progress at Senior level in recent years but are facing an uphill task. Rosapenna, who are also through to the last four of the Senior Cup, are led by Irish international Eddie McCormack.